Start time: 8.15 Saturdays and Mondays (and Thursdays from March to December), or 7.15 daily from April to October (except Sundays). We are comparing Vatican VIP Experience Private Tour Prices from leading ticket suppliers and Try to find you Cheap tickets prices on the market. See the Vatican City without the usual hordes of tourists on a VIP Vatican City Tour. You'll get to enter the Vatican complex before it opens to the masses and take a comprehensive tour of the Vatican Museums, including a visit to the Cabinet of Masks. Visit exhibitions which are usually off limits to visitors. This tour will begin with a walk across the open pine courtyard to the Vatican cafeteria where you will enjoy a complimentary Italian buffet breakfast. After you've drunk your morning coffee and enjoyed delicious pastries you'll get to tour the museums with an art historian guide. Tate your time to marvel at Renaissance artworks in the Raphael Rooms, elaborate textiles in the Gallery of Tapestries and stone sarcophagi in the Greek Cross Room. On this early morning tour there'll be no need to push and shove to get close to the exhibits, just stroll hassle-free from one masterpiece to another. And that's not all! You'll also have priority skip the line entrance to St Peter's Basilica and free time to visit the official home of the Catholic Church, the Sistine Chapel. The Vatican City is one of the top things to see on a visit to Rome therefore the attractions are generally packed with people. This tour is great for people who want a quieter and more relaxed visit to the Vatican City. Ideal for history buffs and art lovers. Children can enjoy this tour however youngsters may find the 3.5-hour tour a bit too long. Your Experience With Vatican VIP Experience Private Tour? Skip the line and miss the crowds with exclusive early entry to the Vatican Complex. Enjoy a buffet breakfast of typical Italian pastries, juice and hot beverages. Take an extensive guided tour of the revered Vatican Museums, skip the line to St Peter's Basilica and marvel at the frescoes inside the Sistine Chapel. Benefit from the privacy of a VIP tour. Learn about the Sistine Chapel and the history of the Catholic church from an expert guide. See the works of renowned Renaissance painters and sculptures. Appreciate the wonders of the Vatican City without the usual crowds. What Vatican VIP Experience Private Tour Includes? Skip the line entrance to Vatican Museums and St Peter's Basilica. Buffet breakfast in the Vatican Cafeteria. 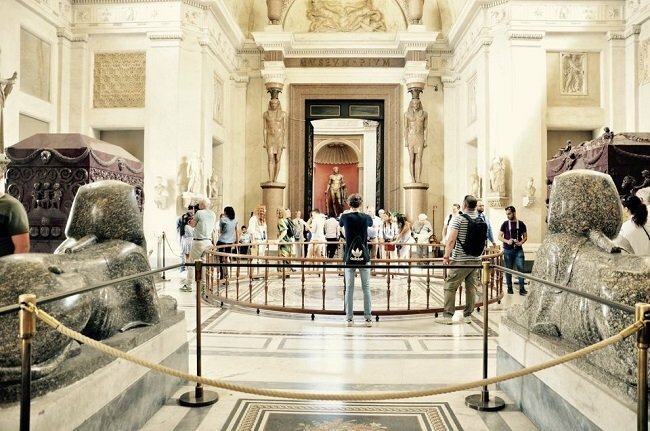 Extensive guided tour of Vatican Museums. Belvedere Courtyard – Pinecone Courtyard – Vatican Museums (including Gallery of Maps, Gallery of Tapestries, and Cabinet of Masks) – Sistine Chapel – St. Peter's Basilica. Be prepared to share your tour with a group of up to 15 people, other groups will also be present but the attractions will be far less busy than they are on standard tours. Come with an empty stomach, ready to fill up on the complimentary breakfast. Travelers Reviews about Vatican VIP Experience Private Tour? This tour has a 4.2-star rating on Get Your Guide and 5 out of 5 from TripAdvisor users. Most reviews come from Viator. Most travellers have left 5-star ratings and agree that a guided tour is essential for understanding the complexity of the Vatican City. The majority of travellers have recommended the breakfast but some comments have said that it is just ‘ok'. Please bring printed or mobile tickets. Tickets are refundable up to 7 days (or 24-hours, depending on provider) prior to departure. Dress Code: comfortable shoes are recommended and to enter religious buildings, knees and shoulders should be covered. To be confirmed in booking confirmation.